The concrete driveway on your home is designed to provide years of use with the right care and maintenance. Even with the best care and maintenance, though, eventually your driveway will wear out and you will want to replace it with a new concrete driveway installed by your Houston concrete contractors. Let’s take a look at the life of a concrete driveway so you can get a better idea about everything you need to know. Your concrete driveway began as a plan drawn out on paper or in a computer app. The design of your driveway is essential to making your home look aesthetically pleasing. You want to make sure the shape, size, and route of the driveway best suits your needs. For instance, if you have a two-car garage but three vehicles, you will want to include a parking space off to one side for the third vehicle. Once you have a design created, the next thing you will want to do is check with your local municipality office/county clerk to see if you need a residential permit to have the driveway installed. It is important to determine the right amount of concrete to use for the driveway. Ideally, you will want it to be a minimum of four inches thick. Otherwise, it will crack and break because it will not be able to support the weight of vehicles on it. If you want to increase the longevity of the driveway, as well as the amount of weight it can support, you should consider adding another inch of concrete. 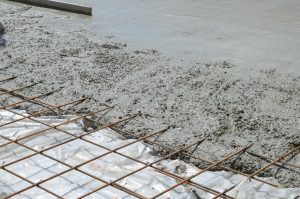 To calculate the amount of concrete you will need, you need to multiply the length times the width times the depth. Then you divide the result by 27—the number of cubic feet per cubic yard. 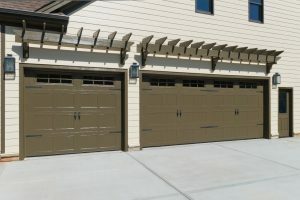 For example, you want a rectangular driveway and measure out the length from the garage doors to the curb of your street and find it to be 50 feet. Next, you measure the width across the driveway to accommodate a two-car garage with a little extra space on both sides, and it is 15 feet wide. Now you multiply 50 times 15 to get 750. Whether you want a 4-inch- or 5-inch-thick driveway determines what you multiple 750 by. If you want a 4-inch-thick drive, then you would multiply it by 0.34 inches. If you want a 5-inch-thick driveway, then you would multiply it by 0.42 inches. For a four-inch-thick driveway, the result is 255, and a five-inch-thick driveway is 315. Now divide this answer by 27. For a four-inch-thick driveway, you will need 9.45 cubic yards of concrete. For a five-inch-thick driveway, you will need 11.67 cubic yards of concrete. This number is how much concrete your Houston concrete contractors will need to order. Please Note: The calculations used here are for illustrative and informational purposes only; the amount of concrete you’ll need for your driveway can and will vary, based on its desired shape and depth. Now that you have your concrete driveway design and know how much concrete your contractors need to order, the next step is to prepare your driveway. The dirt needs to be dug out, and the subgrade has to be properly prepared. There are different methods used to prepare the subgrade, depending on the type of soil you have. In Houston, homes can have various clays, loams, and sands or a combination thereof. Most homes within the city limits typically have a dark clay soil. The subgrade must be compacted and leveled prior to pouring concrete on top. In addition, crushed rock or gravel is often used to help even out the area, as well as to address problems with soft soil. In some cases, a soil plate compactor might be required to ensure the soil is nicely compacted. Once the subgrade is prepared, the next step is to build a frame around the area with the right forms and reinforcement materials. The frame will contain the concrete once it is poured. To ensure a solid finished concrete driveway, you will want to add some type of reinforcement over the subgrade. Most people choose steel reinforcing bars that are connected together in each section of the driveway. These “mats” help increase support for the concrete and give it strength. Additionally, the steel “mats” ensure a more even disbursement of weight on the concrete. The concrete must be mixed prior to pouring it. There are various mixes, depending on the end result you desire. You can learn more about the different types of mixes available by speaking to your Houston concrete contractors. There are also different methods used to pour the driveway. The most common one is to use a concrete truck and pour the concrete right from the truck. If it is not possible to get the truck into the right place, a wheelbarrow can be used to transport the concrete and fill up each section of the driveway. Another option is to use a special concrete pump to pump the concrete from the truck to the pouring area. After the concrete is poured, it must be made even so it is flat. The surface does not need to be level, and it should slope away from the home and toward the street to ensure proper runoff and drainage. The concrete must also have joints added to it before the concrete sets. Joints are one-inch-deep cuts made into the concrete every four feet or so. The joints allow the concrete to expand and contract to changes in temperatures and help prevent cracking. Joints can be made into the concrete to create a special pattern or other such design effects. In addition to the joints, the top surface of the concrete should get a “broom finish” to help ensure proper traction and keep the concrete surface from becoming slick once it sets. A “broom finish” is not needed if you are using a different finishing method like a texturized colored finish. Now that the driveway is poured and finished, it must cure. The curing process involves adding a moisture-retaining barrier over the surface. This can be done by applying a liquid curing compound or a special plastic sheeting. The concrete needs to retain some moisture as it hardens and cures, to prevent cracking. A sealant should also be applied, as this will help deter staining. It is important to stay off the surface of the drive while it is curing. Depending on the humidity levels and temperatures, curing can take between three to seven days. You should also avoid driving over or parking vehicles on the driveway until it is fully cured. Keep the driveway clean. You should use a broom to remove dirt and debris from the surface on a weekly basis. You may also use a garden hose with a nozzle—but not a power washer—to hose off dirt and debris. Clean up stains right away. To avoid stains from setting into the concrete and eating through the sealant, you need to clean them up right away. If you work on your vehicle at home, on top of the driveway, you should put down a tarp or another protective covering to catch any oil, grease, or other fluids. Never use harsh cleaning chemicals. Certain chemicals will eat through the sealant and can cause the concrete to deteriorate, break, and crack. Fix cracks right away. Concrete can develop small fractures and cracks over time, even with the best maintenance. 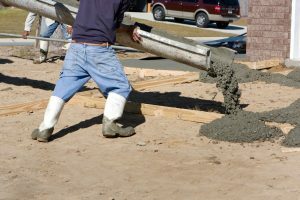 Make sure to have these repaired right away by your Houston concrete contractors to stop them from increasing in size and weakening the concrete. Keep heavy vehicles off the driveway. Delivery trucks and other commercial vehicles should never be parked on the driveway, as residential driveways are not designed to support the weight of these vehicles. Once the driveway gets to the point where it is developing a lot of cracks, chipping, and other such problems, it is usually time to replace the driveway with a new one. For further information about residential concrete driveway installation, repair, restoration, and other services in the Houston, TX area, please feel free to contract CCS Concrete Driveways (Cross Construction Services) at 713-254-1703 today! We also build patios, patio rooms, and patio coverings.